We Tibetans consider the birthday of His Holiness the Dalai Lama to be extremely important. We are most fortunate that he lights our way like a blazing torch as we pass through these dark and difficult times. His birthday, therefore, is an important occasion for us. Born in the Land of Snow, His Holiness is the protector and refuge for all the Tibetan people. This enormous good fortune brings delight to all of us and also gives us great courage. However we might celebrate his birthday, we can recall his life story and his worldwide activity to benefit others. In relation to any advice he might give us, it is essential that we consider how we can assist him and implement his counsel in its true sense. Not only has His Holiness devoted himself to improving our material welfare externally, he has also encouraged the growth of our spiritual welfare internally. In response, from our side, we should think about how we can develop ourselves further. In particular, we can study the Buddha’s teachings, which benefit our minds, and increase our love and compassion, which benefit how we manifest in the world. It is critical that we study the Buddhist sciences to enrich and expand our minds and seek to improve our behavior by increasing our love and compassion. In the flow of our daily life, it is essential to remind ourselves of this again and again. Q: HH the Fourteenth Dalai Lama has given the advice that all Tibetans should come together as a unified people and maintain harmonious relationships with one another. How can we keep Tibetan culture and customs alive and prevent them from dying out? A: In any area we address, harmonious relationships are paramount, and therefore, we should try to build these. Such connections, however, are difficult to develop and easy to destroy. Whether we are speaking about unifying the three main areas of Tibet, the interrelationships of Tibet’s spiritual traditions, or the intermingling of its people from different localities, in Tibetan history we have probably not seen such love for the entire country, such allegiance to Tibet as a whole and for the people born in the Land of Snow. This has come about through the leadership and guidance of HH the Dalai Lama, who has emphasized the importance of these connections. Also for this to happen, the main religious leaders of Tibet and many sincere Tibetans have devoted their time and effort unsparingly. Now that we have this excellent outcome, we should not let it go to waste but protect and maintain it. Within Tibetan society, some people still hold on to their narrow preferences for their particular areas of Tibet. We should see this as harmful and be very conscientious and aware of this. His Holiness is in his eighties, yet he still travels everywhere and makes the Tibetan situation widely known to the world. All the while he guides Tibetans and supports the Dharma and the Tibetan culture. Following his lead, we Tibetans should also take great interest in the Dharma and in our culture. In particular, the population of Tibetans living abroad is growing. They should take a greater and growing interest in their traditions of Dharma, culture, and language, both written and spoken. If they can learn these thoroughly and maintain their connection with them, in the future they will have the necessary courage to ask others to respect and preserve their precious tradition and language. If they are not proficient, they will not have enough confidence to make this request. Q: Your tours have mainly taken place in Europe and North America. Is there a reason for this? Do you prefer these places? A: There are special reasons for going to Europe and North America. As for Europe, the Tibetans have a special and close historical connection with England, so I recently went there for the first time. This last tour was my initial journey to Canada, which has the greatest population of Tibetans in North America. I visited various Dharma centers and met many disciples. The special feature of the tour was to meet with the Tibetan people living in Canada. This was our plan and it turned out quite well. Q: In Canada you were very helpful to the Tibetans and gave them a lot of advice. What do you think is the greatest difficulty that Tibetans face in Canada? What advice would you give them about the areas where they should focus their efforts? A: There are two main points. First, Tibetans need to focus on their culture and especially on spoken and written Tibetan. Secondly, they should work together to enhance their harmonious relationships and stay united. For Tibetans living abroad in general and, in particular in Canada, which has such a large population of Tibetans, the burning question is: Can our new generation of Tibetans born abroad make a sustained effort to hold, preserve, and invigorate the Dharma and their culture? We should all be deeply concerned about this situation. For many young Tibetans abroad, even learning to speak and read Tibetan is difficult. If you do not know your own language, how can you possibly preserve the Dharma and the Tibetan culture? The direct link to them, which is our language, has been cut off. It is critical, therefore, that Tibetans should study their language wholeheartedly. These are my thoughts and my hopes about this. But just expressing a hope or thought is not enough. We need methods and good policies to actually accomplish this. Generally, in the places where Tibetans live, social welfare groups have been set up. They do teach children Tibetan language along with Tibetan songs and dances during the weekends, yet one wonders how much is learned studying just one or two days during the weekends. This is why it is especially important that parents speak Tibetan to their children and also teach them writing. They should take a greater interest in how their children are leaning Tibetan, for learning a language depends on many different factors. Since the number of Tibetans in Canada and the States is growing, I think it would be good if Tibetans open their own schools. This would mean that children could study not just on the weekends but also throughout the week. There are Tibetan schools in India, and they do have some problems in finding teachers; however, if we would not be deterred by difficulties and just go ahead with the project, I think it would turn out quite well. I had the opportunity to mention this before, and it is important to consider our situation deeply and from different angles. If we do not do this now, the problem will become increasingly urgent. All of us must combine our energy and give our full support to the study of spoken and written Tibetan. If Dharma centers, social welfare associations, and public or private groups could work together and create these schools, I think it would turn out well. Q: In Canada for example, you spoke about Tibetan restaurants and mentioned that the names of the restaurant and all the dishes should be written in both Tibetan and in English. Many people appreciated that. On your birthday, your parents sent a message of greetings to you. Were you able to respond? A: At first I did not know that my parents had sent a message through social media. Someone I knew showed it to me. In contrast to previous years, this year many people have shown an interest in my birthday, especially in Tibet and India. Because of these birthday celebrations, it seems that people paid more attention to me, and in relation to that, more attention to my parents, who were asked to say something. Looking at the video gave me a strange feeling—something inexpressible that could bring about tears—and I became very sad. In their birthday message, my parents were not speaking to me directly but generally offering their prayers for my benefit. Since they did not address me directly, there was no particular reason to respond to the message. Q: While you were in Toronto, Canada, speaking with Tibetans there, you expressed the wish to return to Tibet. Is it to meet the many who remain in Tibet and face many difficulties there? Is it to keep a connection with them that you are going, to show your solidarity? And in your birthday message you said that you wanted to return to Tibet. How would you accomplish this wish? A: The main reason for speaking about this in Canada is that within the community of Tibetans living abroad, we have seen a lot of political arguments about the Middle Way, independence, and so forth. But actually we do not really think about the situation in Tibet, which is like being caught inside a bonfire. Outside Tibet people just trade words back and forth about whether their political views are in accord or not, and this is quite deplorable. We need to know directly what the situation is like inside Tibet. Of course, we can learn about it through the media but it is best to go to Tibet and experience it for ourselves. For Tibetans living abroad, it is easier to go to Tibet because they have become citizens of the United States or Canada, for example. They must go and see for themselves what it is like in Tibet rather than keeping a superficial understanding based on looking at photographs. By returning to Tibet, they will see the environment with their own eyes and converse directly with Tibetans who have spent their lives in Tibet. From this experience, they will definitely get a real feeling for the situation there. Some Tibetans living abroad have returned to Tibet and come back changed. Before they did not know the real situation in the Land of Snow and seeing it transformed them. Before they did not have a strong feeling of love, not much interest in Tibet or feelings of allegiance to their country. Afterward they had true interest in Tibet and increased love and affection for its people. To develop a true feeling of love and compassion, Tibetans living outside of Tibet should journey to Tibet. It is important to gather experience personally and not rely on information coming through others. If we can take such a trip, a flow of connection between Tibetans inside and outside of Tibet would continue. If this does not happen, the Tibetans inside Tibet will not know about those outside Tibet and those outside Tibet will not know about the Tibetans inside Tibet. My own personal reasons are that I was born in Tibet and recently I had the experience of seeing my parents on social media, which created a strong emotional reaction within me. In addition, seventeen years have passed since I have seen them and my father, for example, is in his eighties and we don’t know how much longer he will be with us. 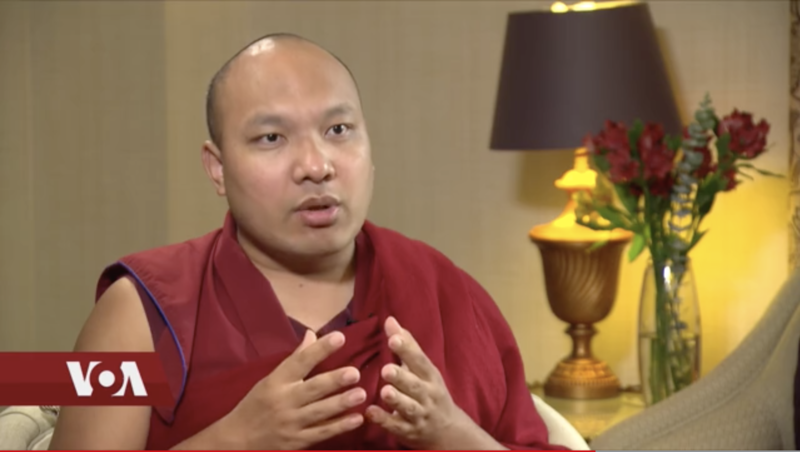 Since I’ve been given the impressive and famous name of the Karmapa, I have many important responsibilities but before this happened I was a simple human being. As such, if we are fortunate, we should be fulfilling the wishes of our parents and taking care of them. This is not just true in Tibet, but in India, in China, and in many other cultures. On the basis of an emotional reaction of having seeing my parents, I spoke rather strongly. In general it is said that Tibetans are a people who have hopes, such as celebrating the Losar in India one year and then in the next year, celebrating in the Potala or Lhasa. In one way my aspiration of going to meet them in one or two years was made in that context. My parents are both elderly, and since we do not know when they will pass away, if I do not go in a couple years, it could be difficult to meet them. That is my hope but it would be difficult to fulfill it because it depends on so many different circumstances. Q: Your Holiness has the wish to go to Tibet and many others wish to go as well. However, the Chinese Government, especially since 2008, has created huge obstacles for Tibetans in Tibet. Those who wish to visit Tibet do not receive permission. The Chinese government creates great difficulties for people that wish to visit their family members and they do not give permission to people to return to Tibet. What do you think about this? A: For human beings in general, it is depressing to have half of one’s parents and relatives in one place and half in another. That parents meet with their children is a human right. Not being able to do this obstructs one’s right to happiness, and what accords with generally accepted human rights should be followed. Taking my case as an example, there is no hope that my parents would be allowed to come to India. They are heavily monitored. Even if they want to visit Lhasa or China, they have to submit a request for permission to go and sometimes it is granted and sometimes it is not. They also do not have passports, which are needed to travel abroad. Altogether, it is a very sad situation. Q: Will you make an appeal to the Chinese government? A: I don’t have any special appeal to make to them, since it’s clear that there’s nothing that can be done. Whether I make an appeal or not makes no difference. But there could be other options, for example, if they could not come to India, it would be fine if I could meet them in another country. Q: In conclusion, I would like to ask about your greatest concern in terms of Tibetans inside and outside Tibet. In which areas should they focus their efforts? A: I don’t have great knowledge about Dharma and politics. It is very difficult to say directly what the situation is. Currently our situation as Tibetans in exile in India is difficult in one way because Tibetans living in Tibet cannot come to India while many of those in exile in India go abroad and some return to Tibet. The situation of Tibetans in India is quite difficult, since they do not have a valid identity card, Indian citizenship, or a passport. It is not at all easy to obtain Indian citizenship, and even if Tibetans obtain it, they have to face numerous difficulties. And Tibetans do not have the full rights granted under refugee status. Given all of this, the Tibetans in India are like foreigners. They do not have a place where they can feel secure or make their livelihood, a home where they can always stay and feel relaxed, and for this reason they try to go everywhere in the world. Since I am a lama, many people come to ask me for divinations. They ask, “I’m going abroad to this or that country. Which place is best?” They do not wish to live underneath the umbrella of the Central Tibetan Administration. Therefore in future, the Tibetan government in exile may find itself in a difficult situation. On the other hand, under the guidance of HH the Dalai Lama, the Tibetans have come to rely on him for everything and have placed all their hopes in him, but the fact is HH Dalai Lama will not be with us forever. The future of Tibet is up to Tibetans. It is their responsibility to think about what to do and how to do it. How should we be thinking about the issues in our world? What methods should we use? We can’t just make guesses about these things. We have to study well now so that we can take responsibility in the future. It is critical to consider all of this very carefully. HH the Dalai Lama has stated that we should follow the democratic way; he has given the Tibetans this form of government, which means that now the political tasks should flow from the political leaders. For the future, the Tibetan people should study and become able to take on the responsibilities this form of government demands. We need to value this gift of His Holiness, study very hard, and develop ourselves considerably. Democracy is not just voting, protesting, and arguing political positions; it is essential to study well and take full responsibility, too. Focusing our intelligence, we should think about what is the best thing to do. What is beneficial? How can we help the whole society? Unfortunately people do not think much about this. It is very important to make stable, long-term plans. Going from temporary situation to temporary situation does not help. With this caveat, the wide-ranging interview came to an end.